As explained here, where I cover when kids go back to school, I am kicking off my annual school calendar analysis early this year. In this post, I am covering fall breaks. Fall breaks as I define them analytically are periods when kids have at least a three day weekend, after Labor Day and before Veterans Day. These off days can be for any reasons–they can be labeled as a “Fall Break,” can be simply a three day (or longer) weekend for Columbus Day, or simply can be an artifact of a teacher’s workday/”Professional Development” day being scheduled before or after a weekend. Fall breaks are actually a much more rare phenomenon than you might think if you follow Disney World discussion boards, which are rarely informed by generalizable data. In it, weekends are black, and Columbus Day, the second Monday in October, is in red. You won’t see a single week anywhere in the chart where at least 5% of US schoolkids are off every day. Where breaks exist, long weekends are more common than full weeks off–as you can infer from the patterning of Wednesdays. 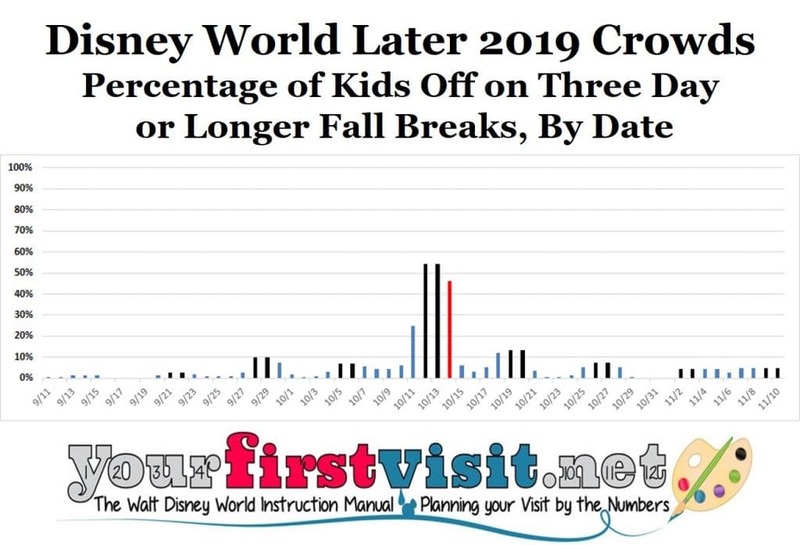 That said, there are multiple long weekends where around 10% of kids–or many more, over Columbus Day weekend–of kids are off, and we know from how spring breaks affect Disney World attendance that 10% of kids off is a big number. In addition, we’ll see another more minor break-enabled bump in crowds Friday October 25 through Monday October 28, and another minor bump the first full week of November, largely due to Jersey week. After I complete this series, I’ll be using this new data to update my 2019 crowd calendar. Besides the availability of school breaks, increased waits in October are also driven folks attracted by the break in summer heat, and over the entire fall party season by poor choices regarding which parks to visit which days. The Magic Kingdom on a day when Mickey’s Not-So-Scary Halloween Party or Mickey’s Very Merry Christmas Party is not showing, and evening hours and entertainment offerings are thus more extensive. –than going over a period with a fall break. The effect of picking bad park days can be quite profound, and is why you’ll see some people report that “October is the new July,” while other people have easy and delightful visits in October. Kelly, the long-time travel agent partner of this site, can help you book your Walt Disney World vacation–during your 2019 fall break, or another time! Contact her using the form below. *Typically September 28 to October 20, or September 21 to October 13. Kids in the more common 60/20 year-round model are on break earlier, from mid-August to mid-September. These dates are for single track models; a portion of kids in multi-track year-round models can be off more or less any week. Only about 4% of US schoolkids are on year-round schedules of any sort. A similar number of kids are home-schooled; they also can be off basically any week. My charts treat every kid enrolled in a district as though they are on the district’s traditional calendar, as there’s no way to further disaggregated attendance by track.